Before we take a look at the performance numbers, let’s take a brief look at the test system that was used. All testing was done using a fresh install of Windows 10 Professional 64-bit and benchmarks were completed on the desktop with no other software programs running. ALL COOLERS will be using Noctua NT-H1 thermal compound, which requires zero cure time. 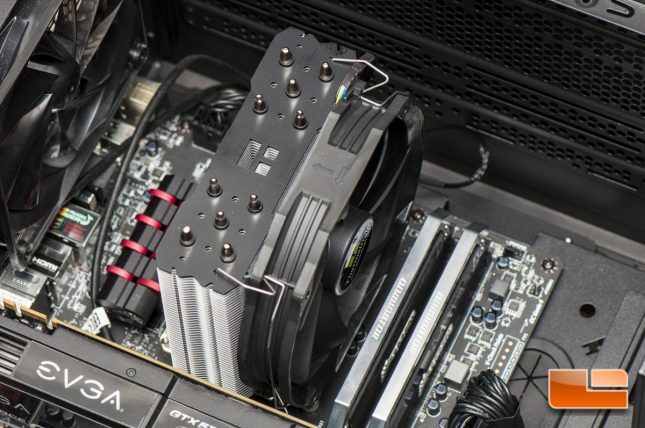 The Intel Z97 platform that we used to test these coolers was running the MSI Z97 Gaming 5 motherboard with BIOS version 1.D that came out on 02/17/2016. We will be sticking with this version of the BIOS between all coolers. The processor used, the Intel Core i7 4770k, will be using the stock frequency of 3.5GHz with turbo boost enabled, which can boost it up to 3.9GHz. Low power state is enabled and the CPU frequency and v-core are set to AUTO, just like they were out of the factory. When we do our overclocking, the 4770k will be overclocked to 4.4GHz at 1.1850 volts, which is just a hair over the stock 1.1755 volts read from Core Temp. This particular 4770k may have a little more in it, but I had difficulties with going above 4.5GHz while retaining reasonable temperatures, so I settled on 4.4GHz.